I’d like to discuss something which I am yet to see mentioned amongst ex-Christians. It is the Bible’s viewpoint on rewards in Heaven. Throughout my journey in quizzing the nature of the Bible in certain quarters, the reward system horrifies me, only to be beaten by the horrific nature of Hell, punishment and justice. This is a massive problem, coming into direct conflict with my personality, as I’m sure it will for many of you too. Throughout my mere 20 years on this Earth, I’ve received many awards and rewards for academic and extra-curricular activities. I’m not a straight A student, but I’ve always modelled myself on working damn hard and that even if the end result is not what I had hoped, I can always say that I put 100% effort into it. Yet each time I picked up a certificate, a thank you card, a monetary gift, it was always done through humbleness and humility. I’m not keen on rewards, because any good act that I do, I choose to do because any decent person would do it anyway. To my disgust, I see countless Christians on the internet using these rewards as a motivation to be ‘good’. And in turn, they claim that because they are reborn in Christ, they are new creatures doing God’s work. Incentives can spur people on to do great things, let me clear that bit up. However, to constantly recite it as a sort of mantra is disturbing. Two years ago, I decided to go on a weight loss journey. I used the incentive of my friends seeing me looking sharp, trendy, slim and lean. However, after I had achieved my weight goal, it was difficult to find a source of motivation. My friends became used to the way I looked and behaved about nutrition and exercise. I looked for a new goal. I decided that I could carry on because if I didn’t, I would regain all my weight, look ugly and once again, become the centre of mockery. However, this is a terrible way to make a decision on health. I concluded after watching much of The Biggest Loser with Bob Harper and Jillian Michaels that I should carry on with being healthy, because it is the RIGHT thing to do for my body and mind. It was a choice to change my lifestyle. Now, I shall refer back to the idea of rewards and doing good deeds. For every human being that is living now and in the future, doing good deeds should be done because it is the RIGHT thing to do. Empathy is an emotion I often use when doing a kind act. I try to imagine how the other person is feeling and do something in return to help them. We know it is the right thing to do because there are no negative consequences, only positive consequences which are often found through a simple ‘thank you’, a hug, a kiss, a favour returned. You get the idea anyway. Animals have been doing this in herds and packs for millions of years, helping each other to survive, and to add, assist those we have formed attachments to. It’s in our nature. Psychology on our behaviour and attitudes have proven this. I fear disappointment from those around me if I have not done something good. It is through that disappointment that I strive to be better, almost a sort of retributive injection to better myself. Christians tend to use the motivation of Hell, loss of rewards, or their desire to please God as motivation. Pleasing those around us seems to be a secondary answer for them. It seems to reflect an egotistical nature which Christians immediately reject, but when two of those three elements above concern themselves, it’s difficult for them to argue. How can Christians imagine themselves claiming the Crowns of Righteousness when there is unjust punishment to non-believers and sinners? The word retribution and rehabilitation seem to be absent. A Christian cannot be righteous in the wake of such injustice. How can a Christian claim an Incorruptible Crown when their mere values and morals have been corrupted by unjust punishment? An incorruptible soul with no sense of justice is a regression in spiritual growth. How can a Christian claim the Crown of Life when there is a mass dose of spiritual genocide taking place depending on whether you believe in eternal torture or soul extinction? The Crown is beneficial only to you, not the lives of others. Not exactly a Crown of Life. How can a Christian claim the Crown of Rejoicing when as mentioned above, spiritual torture or genocide is taking place? Destruction of sin is fine, but destruction of a soul, or its eternal torment warrants no such rejoicing, not if you're a human being with any sort of morals. 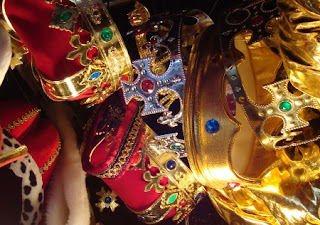 How can a Christian claim the Crown of Glory when the majority of Mankind is lost? There's no glory when loved ones are not there to celebrate with you. The type of rewards one asks for often reflects the type of person they are. I’ve done some regretful things in my life, but the one thing that the dark side of Christianity has done to me is expose that despite all the sins I have done, I harbour values and principles which fundamentalist Christians rarely display. Friendship, loyalty, understanding, compassion for your fellow man. Family, friends, close connections should be the only ‘reward’ anyone ever asks for. It’s what human beings need to survive anywhere.